Finding a trustworthy, reliable locksmith in Fairport, NY can be difficult, especially because unexpected emergencies, such as a lockout, may require a fast solution. However, hiring the right locksmith for the job is important. Not only does hiring a properly trained professional ensure that the job is done quickly, but it can also save you a lot of time, money, and hassle. Here’s what to look for when choosing a Fairport locksmith. Finding a locksmith that is local is important. Obviously, if you are locked out of your home or vehicle, then you’ll want to connect with a local company that can get you back inside as quickly as possible. Another reason that it’s important to find a locksmith in Fairport is that some locksmiths charge extra if they have to travel from far away. Locksmith scams are common in Fairport, and checking up on certifications is the easiest way to ensure you don’t fall victim to one. Look for a locksmith that is a member of a locksmith directory like 1800 Unlocks. These locksmiths have been carefully vetted by a third party for professionalism and quality. If your chosen locksmith isn’t listed on a locksmith directory, then it may be wise to look elsewhere. If an uninsured locksmith breaks your lock, then in all likelihood, you’ll be financially responsible for having the lock repaired or replaced. A locksmith that has insurance provides peace of mind that if a job doesn’t go as expected, you won’t have to pay to replace your equipment. 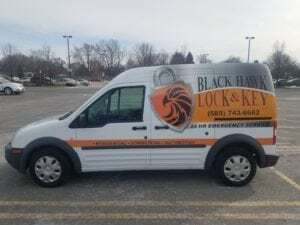 At Black Hawk Lock & Key, we are a mobile locksmith service that provides high-quality, reliable service wherever you are. We are bonded, licensed, and insured, so you know that you can trust that the job will be done correctly, and we are members of 1800unlocks and Fair Trade Locksmith Directory. Each of our locksmiths has received thorough training, enabling them to provide solutions for nearly any security challenge. We sell, install, service, and rekey high quality lock hardware from brands like Schlage, Alarm Lock, Marks USA, Kwikset, Arrow, and GMS. Contact us today to learn about the security solutions we provide or to receive on-the-spot emergency service for a lockout.